Cockpitweb - Airline Pilot Training Software - Become an Airline Pilot - We help you pass the ATPL Theoretical Exams! 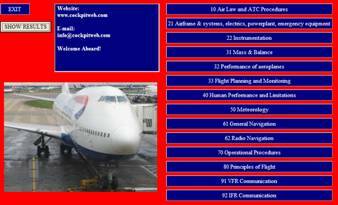 - ATPL database with more than 6800 multiple choice questions. - Divided in 14 courses. - Learn mode to easily scroll through the questions. - Hundreds of trial exams included to test your progress. - All questions can be printed for easy studying. - Developed by airline pilots. Cockpitweb has developed a very powerful Airline Pilot Training Software program to help you pass the ATPL theoretical exams. It's an interactive program to study the ATPL theory. The program also tests whether you are ready for the EASA ATPL exams. Answer the questions or scroll. 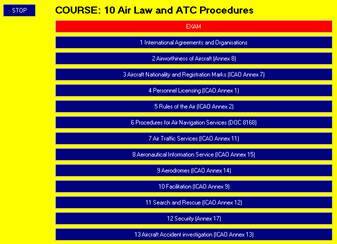 Each course is divided into several chapters. You can practice each chapter separately. Using the programme is straightforward: Select a course, then select a chapter and the first question is shown. Then you either scroll through the exercises using the 'forward' and 'rewind' buttons ([<<] [<] [>] [>>]) or answer the question (A, B, C, D). If you give the wrong answer, the programme will show the correct answer. The programme automatically takes care of the score. Each of the 14 courses contains an unlimited number of exams, randomly generated by the programme. This software programme will get you ready to pass the ATPL-exams! When the exam is finished, the result is automatically saved on hard disk. 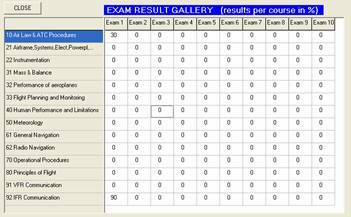 The programme shows the results of the last 10 exams of each course (140 exams).